Prime Minister Narendra Modi also expressed grief over the train accident in Bihar. The Nitish Kumar-led Bihar government has announced to give Rs 4 lakh each to the kin of every deceased and Rs 50,000 to the injured. Patna: At least seven people are dead and several injured as eleven coaches of Jogbani-Anand Vihar Terminal Seemanchal Express derailed in Bihar’s Vaishali district in Sahadai Buzurg on Sunday, said East Central Railway (ECR) General Manager LC Trivedi. Out of the 11 coaches, three of them had capsized. SDRF commandant Vijay Sinha said out of seven casualties, six bodies have been identified. Three are from Bengal and the other three are from Bihar’s Khagaria. Though the rescue operation is still underway, the state government has made arrangements for the bodies to be sent to their families in Bengal and Khagaria after post-mortem, said Sinha. The Nitish Kumar-led Bihar government has announced to give Rs 4 lakh each to the kin of every deceased and Rs 50,000 to the injured. The Bihar CM had expressed grief over the derailment incident and had directed the administration to provide all kind of assistance. An inquiry into the accident will be done by CRS Eastern Circle Latif Khan. The Indian Railways have announced that it would give an ex-gratia of Rs 5 lakh each to the kin of every deceased. Rs 1 lakh would be given to the grievously injured and Rs 50,000 to those who suffered minor injuries, said the Railways. All the medical expenses would also be borne by the Railways. Prima facie cause of Seemanchal Express accident is rail fracture of CMS X-Ing at Barauni end of station yard, said East Central Railway (ECR) CPRO Rajesh Kumar. The unaffected 12 coaches are being moved to Hajipur where more coaches to be attached and the train will move for Anand Vihar Terminal railway station (ANVT). Union Railway Minister Piyush Goyal is in touch with Railway Board members and General Manager (GM) of ECR regarding the accident. Goyal expressed profound grief over the loss of innocent lives in this tragic accident and wished a speedy recovery for injured. Smita Vats Sharma, Additional Director General PR (Rail) said that their entire energy was focussed on rescue and relief operations at the moment. A Railway Accident Medical Van along with a team of doctors are at the site checking the injured people. 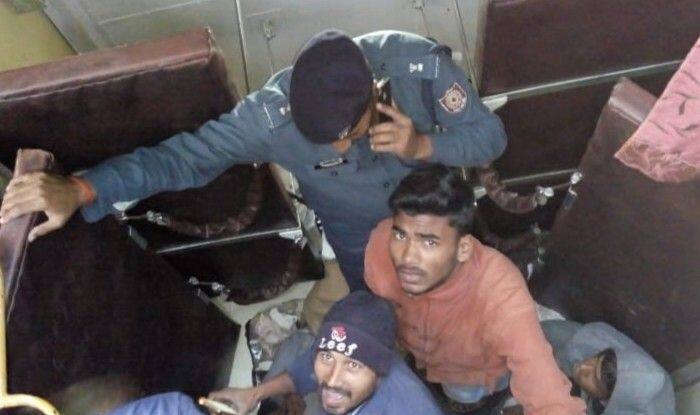 Two teams of NDRF reached the accident site and are rescuing the people trapped inside the train. Meanwhile, helpline numbers have been issued by the Indian Railways. Apart from releasing helpline numbers for Sonpur, Hajipur and, Barauni, it has also released a couple of other numbers at Patna- 06122202290, 06122202291, 06122202292, 06122213234. Meanwhile, all passenger trains on this route have been cancelled following Seemanchal Express derailment in Bihar’s Sahadai Buzurg, earlier this morning. Also, Uttar Pradesh trains for Chapra have been diverted via Muzaffarpur (MFP)-Chapra. The train derailed near Sahadai Buzurg in Vaishali district at around 3:58 AM after crossing the Mehnar Road at 3:52 AM today. One general coach, one AC coach B3, three sleeper coaches -S8, S9, S10 and four more coaches derailed.